At the Sneyd Striders Xmas Pud 10 mile road race in Walsall, Carlo Toledo finished 15th of the 500 runners in a p.b. of 57.25. Ian Summers also registered a p.b. in 60.47 for 37th place. Humphrey Phillips recorded 68.19 for 115th and Doreen Phillips again won the 1st LV50 prize with her 69.48 for 134th place overall and 6th lady. The men were unable to raise a team, having been in action for the previous two weekends, and having to consider other commitments (Christmas shopping!). The ladies retained their 2nd team place overall. Aidan Mercer repeated his performance from Dursley, winning the Under 17 Boys race, with Adam Davies taking 4th. There were wins for Richard Farrow in the U11 Boys race and Emily Pidgeon in the U11 Girls race. Having won the opening two fixtures, Alex Felce travelled all the way to Scotland to take on the best they could throw at him. Their best was only good enough for 2nd, as Alex again won the race. This race was memorable for starting in a hail storm – unfortunately the result was not so memorable, with only 9 men running, a 9th place finish on the day dropped us down to 8th overall. This was disappointing after the good start in the first race, and also a shame for those runners who did not score for the A team, as there weren’t enough of us to register a B team. The second race was at Dursley, a proper cross-country course, with plenty of mud and hills! The men again scraped a team together, and all thoroughly enjoyed the course. The ladies ran well again, staying in 2nd place overall, despite not having the services of Camilla Mottram, out through injury. The Juniors had a good day, with Aidan Mercer, Peter Kellie, Lloyd Pritchard and Adam Davies taking 1st, 2nd, 3rd and 5th in the Under 17 Boys race, and Emily Pidgeon winning the U11 Girls race. At the Gosport Half Marathon on 21/11/99, there were new personal bests for Ian Summers, 34th in 1:21.21 and Doreen Phillips, who was 7th lady overall and won the 1st LV50 prize, in 1:30.57. Also running were John McClean (M50), 76th in 1:27.21 and Andy McKenzie, 183rd in 1:45.31. Some 400 runners finished. This was televised live on Sky. The first race was the Under 11 Girls, and Emily Pidgeon came home in 1st place. In the next race, the under 11 Boys, it was the turn of Richard Farrow to cross the line as the winner, making two Gloucester AC wins out of two races. The Sky commentators were getting interested… After the Under 13 Girls had finished, Alex Felce toed the line for the Under 13 Boys race, looking to repeat his winning performance from the first race. 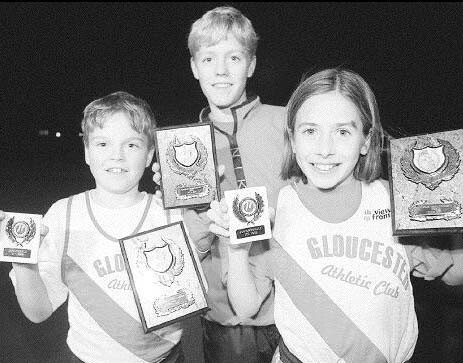 This he duly achieved, and the Sky team were now sufficiently impressed to request an interview to find out about the success of the Gloucester AC Juniors! Two juniors took part in this fixture, with Emily Pidgeon winning the Under 11 Girls race, and Richard Farrow finished 5th in the under 11 Boys race. This was a combined fixture for all divisions, also incorporating the Reebok Cross Challenge. The Birmingham League is regarded as the toughest in the country, and is the most important part of the Senior Men’s cross-country season, with promotion and relegation providing a constant focus. The Senior Men got off to a good start, finishing in 6th place overall, with only a few points covering 2nd to 7th places. Mark Ingram was 4th individual in the Division 4 race. The Club finished last season in 6th place, so to start this season within a few points of a promotion place was a good result, and gave good cause for optimism. This was held in conjunction with the first Birmingham League Fixture, and the Juniors had a tremendous day, with Alex Felce winning the Under 13 Boys race, and the Club taking 2nd team prize in the Under 17 Boys event, the individual places being: 20th-Peter Kellie; 27th-Lloyd Pritchard; 38th-Roland Ilott; 41st-Adam Davies. Russell Steel completed the gruelling Snowdonia Marathon in 4:09.23 for 405th place out of the 755 finishers. Several members took part in the Stroud Half Marathon. Top finisher was Peter Lloyd in 34th in a time of 1:17.52. Humphrey Phillips had a personal best with 1:26.28, and Les Baldwin notched up his 50th half marathon. Plock Court – what a joke! How anybody can call this a cross-country course is a mystery. On grass, yes, but dead flat with nothing to challenge you – boring! 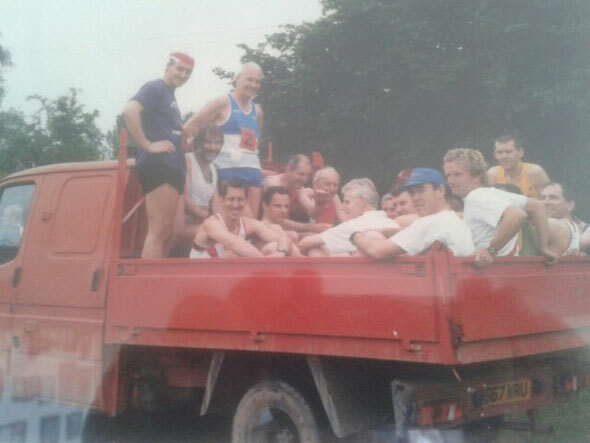 Anyway, the men managed to scrape a team together, most saving their energies for the Stroud Half Marathon the next day, to register a team score, finishing in 8th place. Mark Ingram ran well for 7th individual place in the race. The ladies, defending the title they won last year, got off to a good start, finishing in 2nd place. 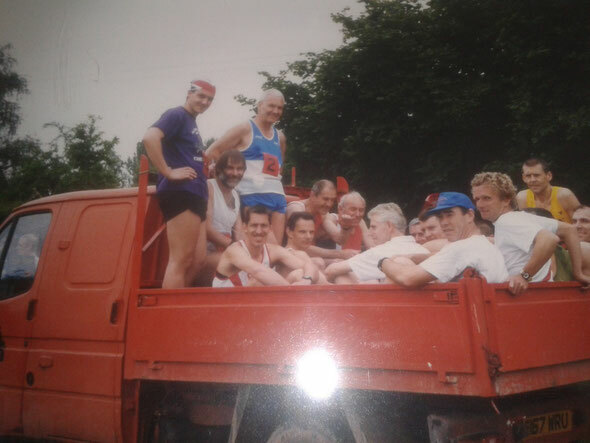 At the Midland Road Relays at Sutton Park on 2/10/99, the men finished 55th out of 99 full teams completing the race. A panic occurred as the team running order had to be changed at the last minute due to one carload missing the motorway exit and arriving after the race had started! The ladies’ team comprising Beryl Sampson, Cath O’Carroll, Marilyn Barwood and Camilla Mottram finished 21st out of 49 complete teams. Last season produced many personal best performances, medals and Titles from the junior club members. Ryan Preddy won the National Indoor AA U17 800m title and set an indoor United Kingdom age 14 best. Unfortunately, his outdoor season was ruined by a shin injury, from which he is still recovering. Lloyd Pritchard took the bronze behind Ryan in the National 800m, so Gloucester AC had two on the rostrum! Lloyd also placed 5th in the 1500m, despite a family bereavement 48 hours before. Adam Davies made the 400m final with a PB. Simon Kellie won the National Indoor Junior Men’s 3000m, but it has to be said he was the only one of his age group who actually turned up! It was a PB however. Brother Peter Kellie had earlier taken a terrific 2nd place in the Reebok Cross-Country Challenge U15 race in Birmingham, and made the top ten in the South West Schools Championships. During the summer, Adam Davies and Lloyd Pritchard won silvers in the Welsh Championships, Simon Kellie a bronze. All three represented Wales in a match aginst Scottish and English schools. Adam later represented Wales in the Celtic Games in Antrim. Liam McGowan won the Northern Irish U17 400m title, and also represented Ulster in the Celtic Games, setting a PB of 51.34 at the age of 15. Eight junior boys from the Club represented Gloucestershire in the English Schools Championships, the largest group contribution to the County team! James Nunan, coached by Lorraine Shaw, has made great progress in the hammer this year, despite being 1st year in the age group. Watch out next year! Nick Edwards made the English Schools 400m hurdles final, finishing 7th with a PB of 55.34 in the heats. Nick had previously won the South West Schools 110m hurdles gold with a PB of 15.10! Adam Davies made the English Schools U17 800m final, taking 6th in a new PB of 1:57.60. In the McDonalds League, the boys eventually finished 2nd in the group, unfortunately behind Cheltenham, who won promotion in the play-off match - a lack of strength across field events and in numbers being the reasons why we did not secure the league championship. Several athletes achieved AAA Grade 1 Standards, however; Richard Davenport U15 100m, 200m, & 400m; Alex Felce U13 800m; Adam Davies U17 400m & 800m; Liam McGowan U17 400m & 800m; Lloyd Pritchard U17 800m & 1500m; Ryan Preddy, despite injury, U17 400m. Several youngsters also competed in the senior men’s team in the Men’s Midland Track and Field League, notably Nick Edwards. Jon Cuff, ranked number 2 in England in the U20 400m hurdles, took bronze at the AAA Junior Men’s 400m hurdles, represented the Midlands Senior Men, and took silver in the Midlands Senior Championships, with several PBs during the season, over several distances - 400m, 400m hurdles, 800m and even 110m hurdles! (Steeplechase next year, Jon?). All in all it has been a tremendous year, with even more to come! The Club won the Men’s Midland Track & Field League Division 6 title this summer, winning all four league fixtures. A combination of the junior and senior members came together to form the team. This resulted in several of those more used to road running trying their hand at events they had never done before - Ian Summers the steeplechase, javelin, discus, 110m hurdles; Andy McKenzie the steeplechase, shot put, discus, triple jump, 400m hurdles; Mark Ingram the 3000m, 400m hurdles, 4x400m relay; Malcolm Bird the 5000m; Humphrey Phillips the 3000m, 5000m; Dave Meadows the steeplechase, 400m hurdles, triple jump; Carlo Toledo the 1500m, 4x100m relay; also the juniors were competing in new events, with Nick Edwards adding the high jump to his repertoire. It was an education for the road runners seeing the younger track & field athletes perform, they really are quite awesome! Dafydd Farr was unbeaten in the discus and shot, and his brother Adam pushed him very close in the hammer, smashing his PB in the process by some 10m. Although we won the division well, it will be tougher next year in division 5. We have a few weak events, so if anyone can high jump, throw the javelin, triple jump or do the pole vault, or if you know anyone who can who might be interested in competing for the Club, please come forward and have a go! Above all, the track & field league is good fun! Transport to the start! How many do you recognise?